Bob Tarte and his wife Linda live on the edge of a shoe-sucking, mink-infested swamp near the West Michigan village of Lowell. 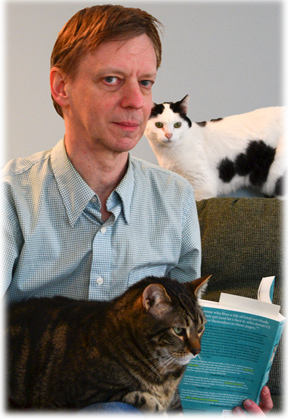 When not fending off mosquitoes during temperate months and chipping ice out of plastic wading pools in the depths of winter, Bob writes books about his pets. Enslaved by Ducks tells how in ten short years Bob went from living a blissful, pet-free existence to becoming the harried caretaker of ducks, geese, turkeys, parrots, parakeets and rabbits. He never realized that he was an animal person until he inadvertantly became one. The sequel, Fowl Weather, goes deeper into both the chaotic and calming effects that the animals have on Bob during a period of turmoil when his father dies, his mom is diagnosed with Alzheimer's disease, and more critters keep arriving. While this may not sound like appropriate material for comedy, Nancy Pearl reported on NPR's Morning Edition, "If you're longing for a book that will make you laugh out loud, then run, don't walk, to the nearest library or bookstore and pick up a copy of Bob Tarte's Fowl Weather." Kitty Cornered, describes sharing a small house with six demanding cats, including a skittish stray name Frannie. Bob eventually comes to see Frannie, Moobie, Agnes, Lucy, Tina, and Maynard as eccentric experts in the art of attaining contentment. Bob's latest book, Feather Brained, describes his bumbling attempts to become a birder – and how he burdens himself with the improbable goal of finding a rare bird on his own that other birders will flock to see. Sy Montgomery, author of Birdology, calls it "laugh-out-loud hilarious, jam-packed with surprises, unexpected adventures, revelatory truths, and jaw-dropping beauty." Bob and Linda currently serve the whims of parrots, ducks, geese, parakeets, a doves, cats, and more. For 15 years they helped raise and release orphan songbirds (including woodpeckers) for the Wildlife Rehab Center, Ltd. in Grand Rapids, and they have the scars to prove it.